You can export stamps you have created to keep a backup of them, or to import them for use in another project. The Export Brushes dialog opens. 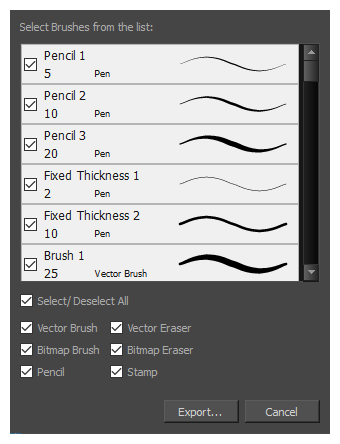 This dialog allows you to export brush presets for the Brush, Pencil, Eraser and Stamp tools. By default, the presets for all your tools will be selected for export. If you only wish to export your stamps, uncheck Select/Deselect All, then check Stamp. Browse to the location where you want to save the .xml file that will contain your presets. Enter the desired file name for your presets file.